This Fisherman medium antique brass nautical ceiling lantern with clear glass shade features a circular ceiling mount and cable suspension, industrial style downward facing lantern, with wide brimmed rim and clear bell glass shade. Fisherman lanterns have been around for centuries to provide illumination during the night. They were originally oil filled and either hand-held or hung from nails in the timbers. The fisherman lantern shown here is a modern interpretation of those early lights. The retro industrial style and subtle antique brass finish makes it suitable for traditional, retro and industrial spaces. The ideal addition to an on trend kitchen, dining room or hallway, installed either singly or in multiples. Height adjustable at the time of installation by shortening the cable, please see the technical information below for exact dimensions. A class 2 double insulated ceiling light no earth required. 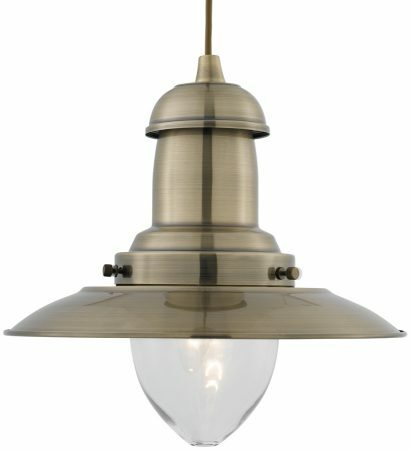 There are matching fittings in the antique brass finish Fisherman lighting range that include a three light pendant, two single pendants, a wall light and floor lamp, please see below. Please follow this link to download or view the installation instructions. Supplied by Searchlight who manufacture some of the best traditional and modern classic designs such as the Fisherman medium antique brass nautical ceiling lantern with clear glass shade you see here.